Find out about the history of the London Chamber. Meet the team who run our London Chamber. Find out how to find the London Chamber. 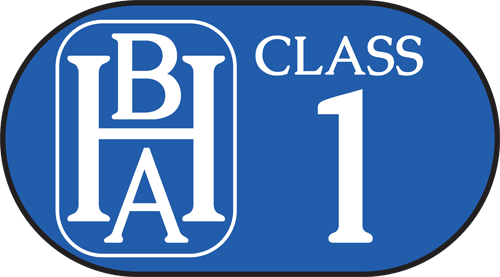 We operate London’s only BHA Class 1* Hyperbaric / Diving chamber. Our Hyperbaric chamber in East London is at Whipps Cross University Hospital, part of the Barts Health NHS Trust. Situated by the edge of Epping Forest near Leytonstone, and beside the A12, it is conveniently accessed by tube, bus and car. The unit is certified according to internationally recognised standards. Available to treat sick divers, as well as the elderly and ill, it is a state-of-the-art chamber purposely built for clinical use in Hyperbaric Oxygen Therapy (HBOT). We are regulated by the Care Quality Commission and provide a safe and patient-orientated service in close collaboration with emergency medicine and critical care consultants at our host hospital. Our mission is to deliver safe high quality hyperbaric medical care, treatment and training in a timely, cost effective and efficient manner. A highly motivated team of enthusiastic, dedicated professionals work together in a pleasant environment for the benefit of the patients. Comprehensive hyperbaric facilities capable of supporting the treatment of patients who are critically ill, from any cause, and who may require hyperbaric intensive therapy. Multiplace chambers capable of supporting the treatment of patients who are critically ill from any cause and who may require hyperbaric intensive therapy; such facilities offer Advanced Life Support. Vickers Monoplace Chamber Nr. 001. The first chamber ever manufactured by Vickers UK for hyperbaric use. Built in 1965, last used in 1998, now in the British museum. The Hyperbaric Unit at Whipps Cross Hospital was the first department of its kind in London; and by the 1990s it was the last. It was established from the beginning as part of the National Health Service. 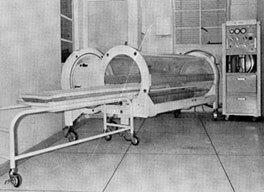 The Hyperbaric Unit was founded in 1965, as a research facility for Vickers, using the first monoplace chamber produced by them for clinical use. This chamber remained in clinical service until 1992, when it was sold to the Wellcome Foundation as a piece of medical equipment history. In September 2000 after a European tendering procedure lasting 18 months the contract for a Private Public Partnership with the Whipps Cross University Hospital NHS-Trust was awarded to London Hyperbaric medicine Ltd.
Construction of the modular prefabricated building commenced in October 2000 in Bremen – Germany, and the whole unit together with the pre-fitted Therapy Chamber arrived at the hospital on the 30th January 2001. The bulding was assembled by the Feb. 6th and the Hyperbaric Chamber System comissioned on March 31st. London Hyperbaric Medicine Ltd. treated its first patient on April 1st 2001. 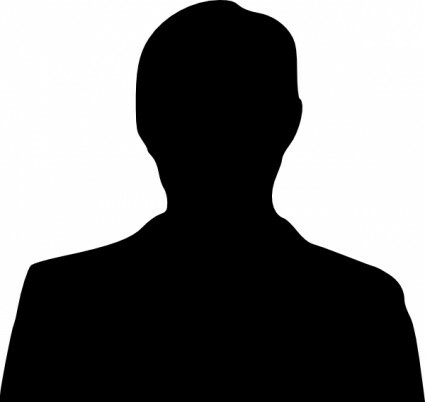 Our facility is run by a great team of experienced, knowledgable and friendly staff. Many of our Doctors, Medical, Admin and other Support Staff are also active divers. Our London Diving chamber is conveniently located for both public and private transport users. Because parking on the hospital site is limited, we encourage patients and visitors not to travel by car wherever this is possible. 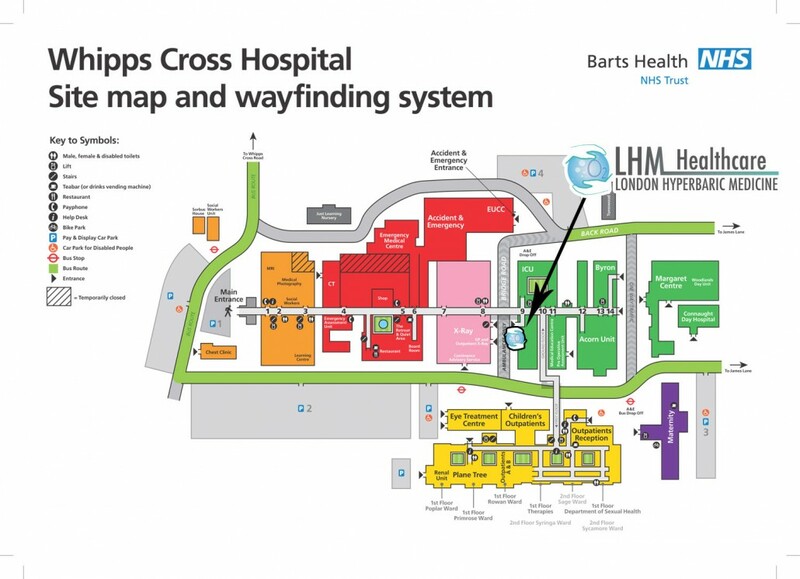 The main entrance to the hospital is on Whipps Cross Road (the A114) between the Whipps Cross roundabout (A104) and the Green Man roundabout (A12). 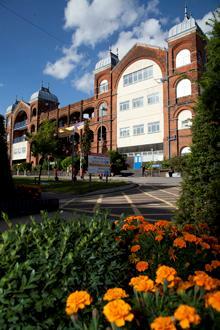 There are approximately 400 parking spaces for patients and visitors on the site – located in four visitor car parks. Wood Street or Walthamstow Central stations are the nearest rail stations. Wood Street and Walthamstow Central are on the Great Anglia Train line from Liverpool Street to Chingford. From Wood Street station, take the bus 230 from Stop: D towards Wood Green Station. 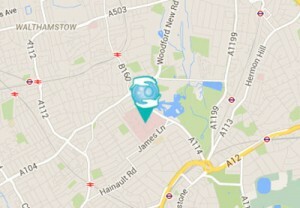 From Walthamstow Central, take the bus W19 from Stop: B in the Bus Station towards Ilford. 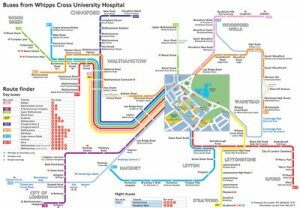 Buses W19, W15, W12, 357 stop within the hospital grounds. Buses 257, 56, and 230 also all stop near the hospital grounds at the Whipps Cross roundabout. The nearest tube stations are Leytonstone on the Central Line, Walthamstow Central on the Victoria line or Leytonstone High Road is on the London Overground Line, from Barking to Gospel Oak. From Leytonstone tube station, take the bus W19 towards Walthamstow / Argall Avenue or bus W15 towards William Morris School from bus stop A. From Walthamstow Central, take the bus W19 from bus stop B in the bus station towards Ilford. From Leytonstone High Road station, take the bus 257 from Stop: F towards Walthamstow Central bus station. Based in London and Great Yarmouth we can handle calls from throughout the UK - available 24 hours a day, all years round. 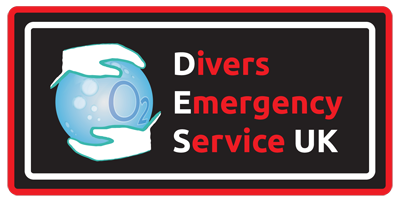 The Divers Emergency Service is part of the LHM Healthcare group. Visit https://www.londonhyperbaric.com to find out more.